there have been very many ups and downs in the past few weeks. i will not bore you with the details, as i have bored myself silly for a full 180 seconds typing and deleting. (i have a very short attention span for boredom.) these pics were taken in between a low and a high, but who's counting? i'm on the ground now, and it is currently hotter than jesus in LA. so hot that i can't think of much else to type. so hot that i must go to bed right this very minute. and so i shall. but you can expect several tons of creativity in the next few weeks. Ouch. Hot. It's hot here, too, and I'm blessing the whoever built our 200-years-old house with thick, thick walls. The heat has one advantage, though: there was a lot of laundry to be done and this way it gets dry very quickly. I wish you sweet dreams and a lot of imagination and creativity coming to you! geri, i hope your team won! i STILL haven't seen xanadu. am i going to love it as much as flash (aah-aaaah)? Wow, those are awesome shots, just beautiful!! Have you tried Peroni beer yet? You just might like it. 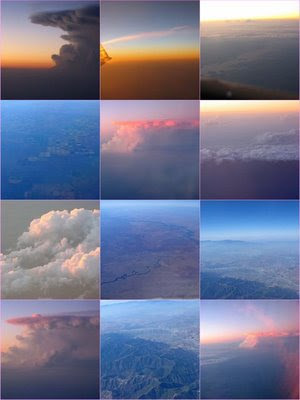 i actually took these cause i know you'll never get on a plane again, and i thought you should see the view.